My very first quilt class was a Mystery Quilt class. The class was in March but it took me until December to finish it! 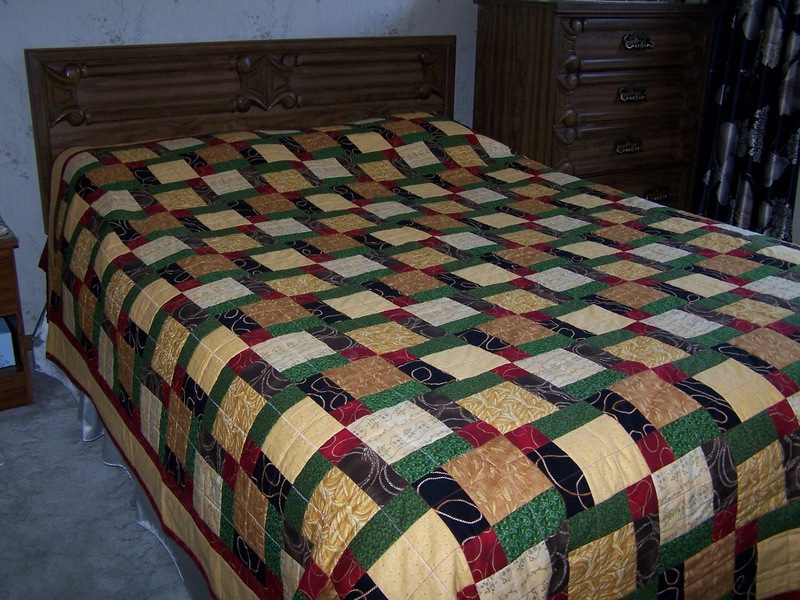 Sure wish I had more time to quilt. I gave it to our neighbor Miss Polly for her birthday. They have been more than neighbors to us and spoil our kids like they are their grandchildren. I hope she enjoys it and that it brings her some comfort as this will be her first birthday and Christmas since her husband passed away. 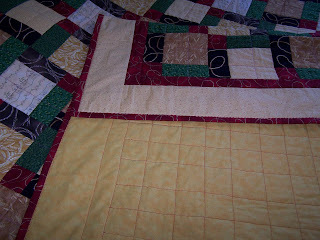 I used the Tossed Nine Patch by Eleanor Burns On this link there is a video about how this is done. Eeesy-peesy!! 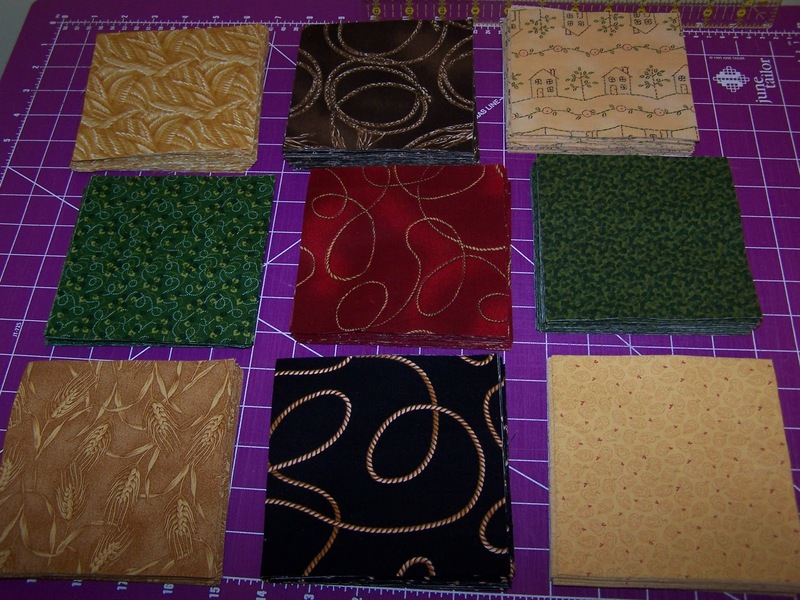 Once I decided on the nine patch, I picked nine fabrics. The wedding was in October so I obviously went with fall colors. Before I left for fabric shopping hubby said that I just had to get a wheat pattern. I agreed, wheat just screams fall on the prairies! I was thrilled when I found a really pretty one (the darker one in the middle) and I also found the one that looked like another grain crop, barley maybe? Then I found the house fabric and thought it was perfect for wedding quilt because it represents a new beginning in marriage for them. The other colors in the house fabric are red & green so I started to look for coordinating fabrics and found the two green fabrics. As I was looking I found the 4th gold fabric that has small bits of red in it that are kind of shaped like tiny hearts - perfect! Then I spotted the black fabric with the gold colored ropes and it immediately reminded me of my brother. Nearby was the brown and red rope fabrics!! 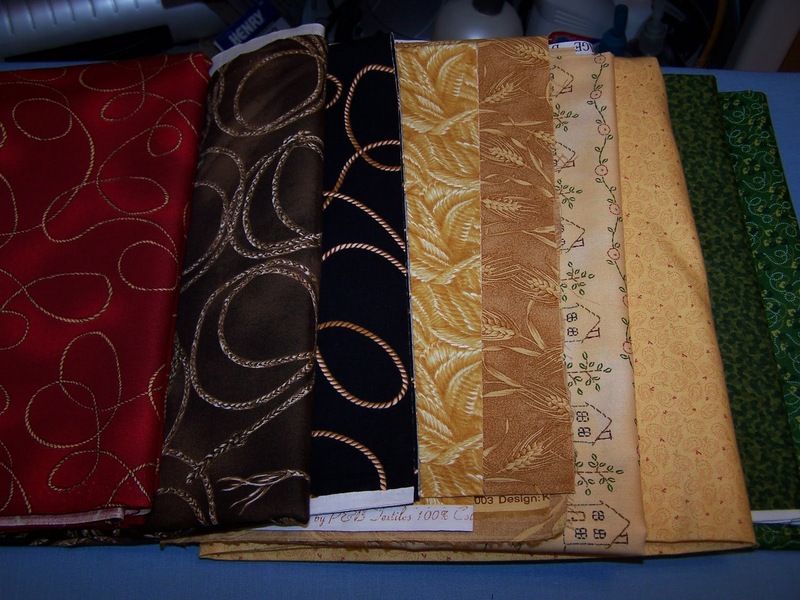 And ta-da I had 9 fabrics! Then I had to cut squares. 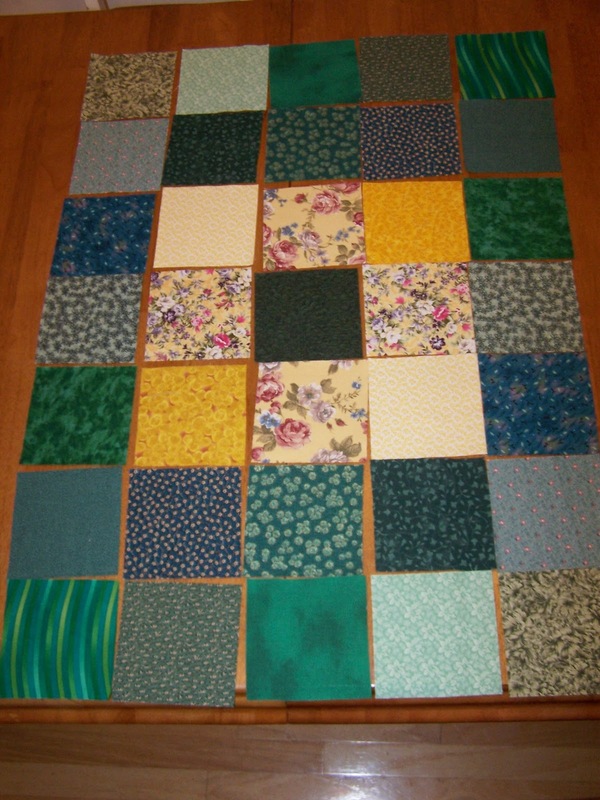 In order to make a queen sized quilt I needed at 42 nine patches. The way the cutting worked out I ended up with 432 squares. 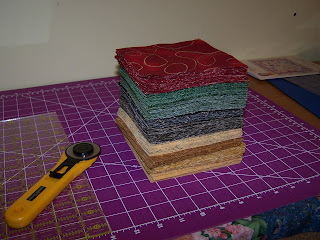 Whew, that was alot of cutting! Carlee was my little helper! She said to me "WOW Mama! 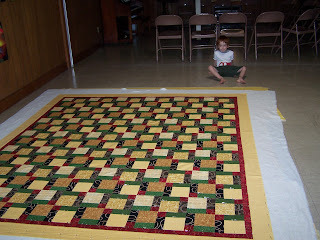 That is alot of squares, can we finally start sewing now!!" 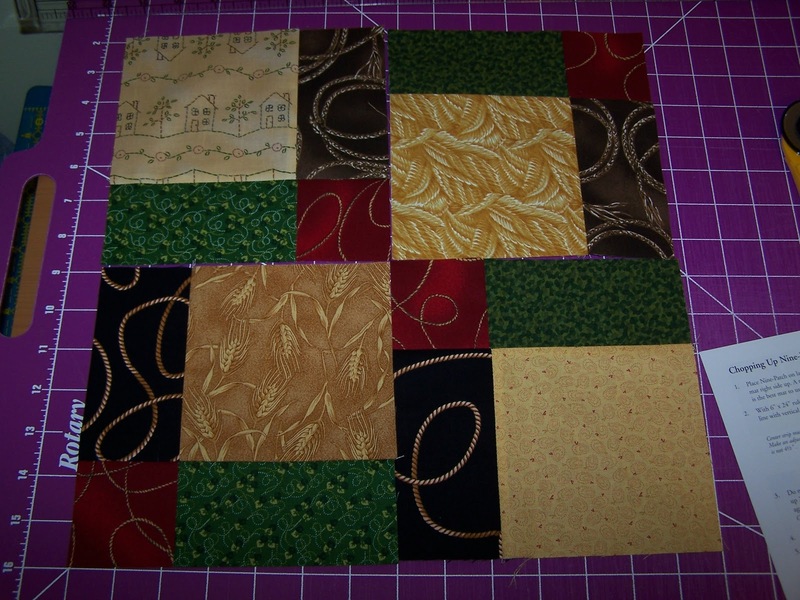 Here are the first few blocks. I didn't get any photos of the borders being put on, or the backing being put together. I was really running out of time. When I pinned it I only had a week left before we flew to Canada and I wanted to quilt it and bind it before we left!! 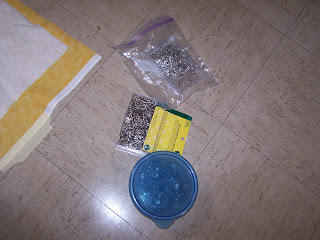 The pinning was quite a chore in itself. There was not enough floor space in the house so I took it to the church. Before I took it up off the floor I walked all over it and if I didn't step on a pin I added another one. 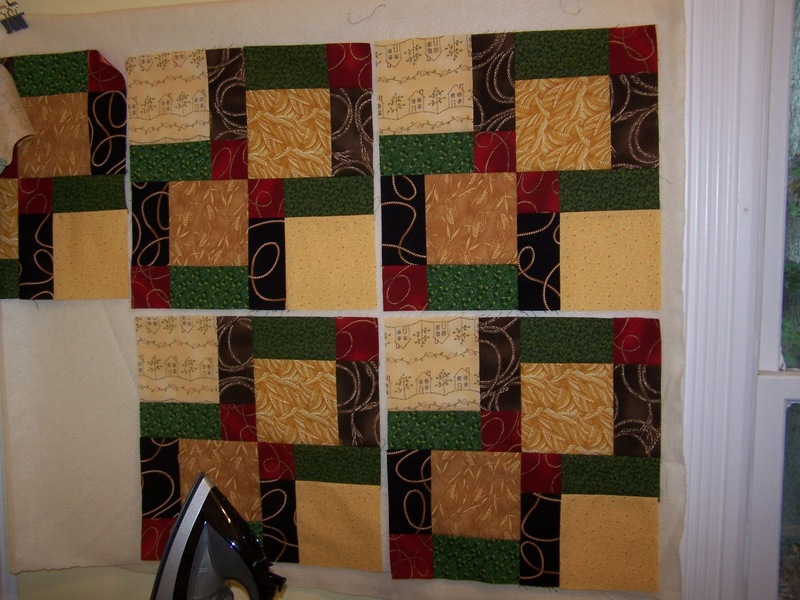 The more pins, the better chance of no puckers on the back when it is quilted. I used about 600 pins to pin the backing and the batting to the top. Here is what it looked like on the floor of the church. 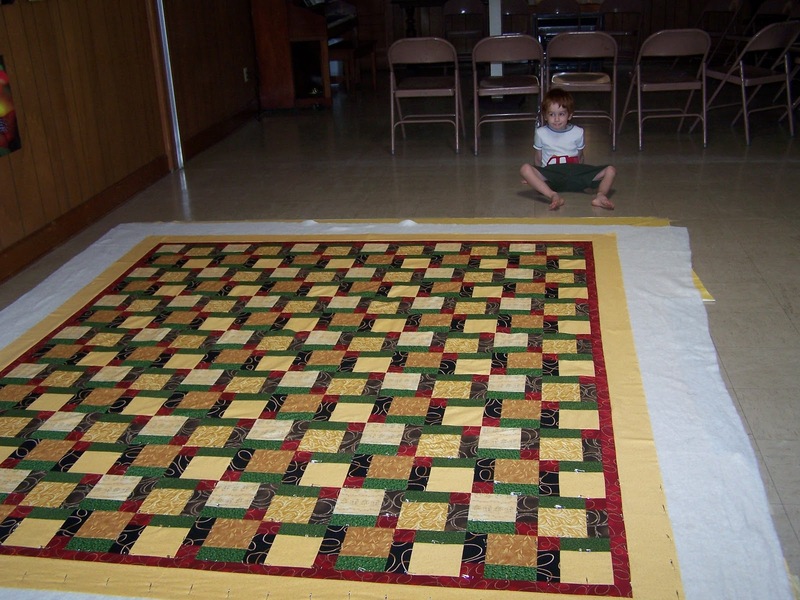 Then began the very long quilting process! It was quite difficult to maneuver all that fabric! I have decided that I will not soon do another queen size quilt!!! This photo was taken with my cell phone. My friend had texted me to see if I was done yet so I sent her this photo back. 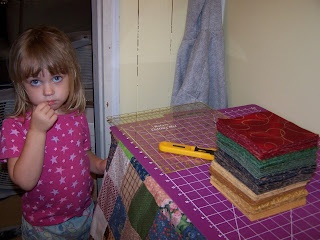 I am glad I did because it is the only photo of the quilting process. 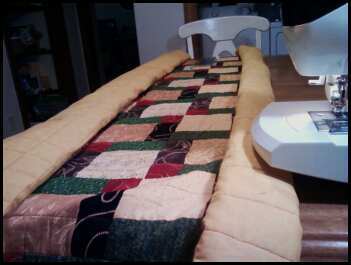 I moved the sewing machine to the kitchen table to have the extra length to support the fabric. 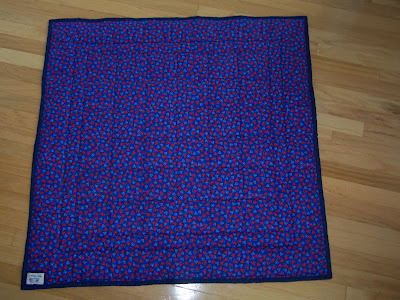 Then I rolled the ends and straight-line stitched every seam. Some of the seams were offset so I used a ruler and a chalk pencil to make a line to follow. But even with all those lines, I still can't sew a straight line!!! I finished the quilting and then the binding. I finished at about 2am the morning before our flight! Now that was cutting it close! Here is a peek at the completed back. I used red thread and it really turned out nicely on both the front and the back. And the finished product. I was really pleased with the results and the best compliment was when I gave it to my new sister-in-law she said "Oh Wow! 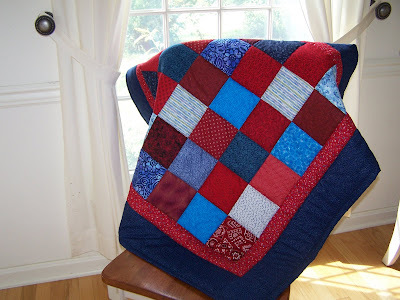 No one has ever made me a quilt before! Thank you!!" Pattern - didn't really have one for this quilt. Just went by how many squares I had. 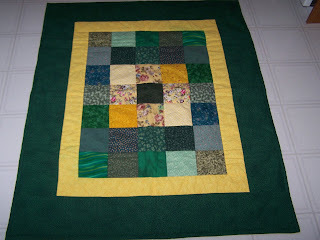 Piecing and Borders - I placed the yellow in the center and surrounded it with the green squares. Label - I spent alot of time trying to decide how to do a label. I eventually designed a label and had some fabric ones made up. I quite like them! 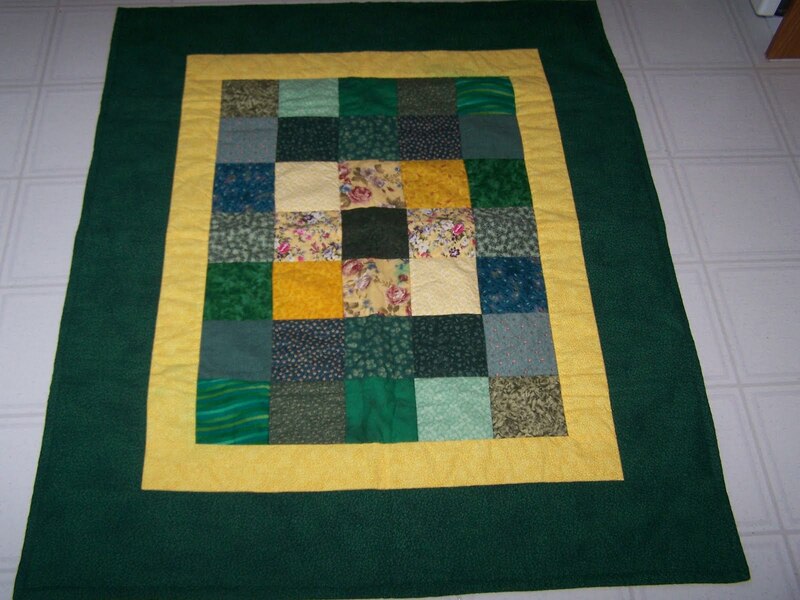 After completing the blue quilt I started the yellow&green one, but never finished it until Aug 2010. Nearly an entire year without even touching my sewing machine! Just down right not acceptable!!! Well I made up for it in Sept. My brother was getting married in October so I made them a quilt. I also decided that the blue quilt and the yellow&green quilts would be perfect for my nieces (my brothers daughters). I wanted them to have a gift for the wedding too. Anyway, next posts are about the making of those two quilts. 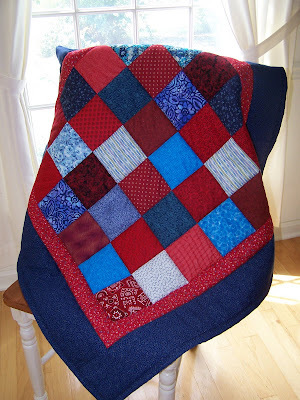 I was done this quilt before the blogger in me kicked in. I should have been documenting all the stages! Oh well, I have many more quilts and projects planned that I can do that for. 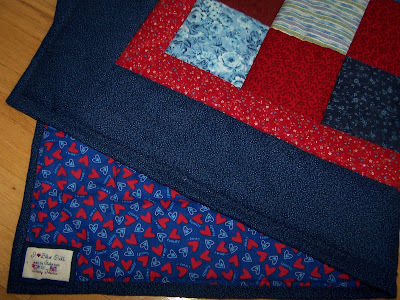 Piecing & Borders - I alternated blue and red squares. 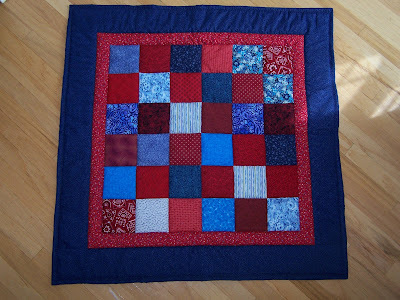 Then I added a small border of red with tiny blue flowers and finally a dark blue larger border. I did not have to piece a backing as the backing fabric was wide enough. Label - I spent alot of time trying to decide how to do a label. I finally cross-stitched one and attached it to the backing. This was a learning experience and I will likely attach future ones differently. 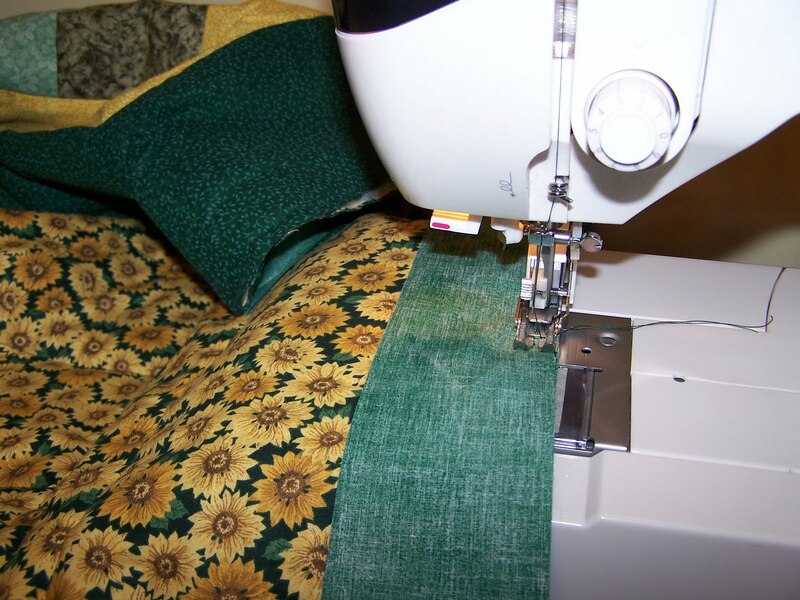 Binding - used the same fabric as the outer border and machine stitched with a feather stitch. That's it, my first quilt shop quilt complete. What do you think? Announcing my new adventure! I have opened a quilt shop on Etsy. 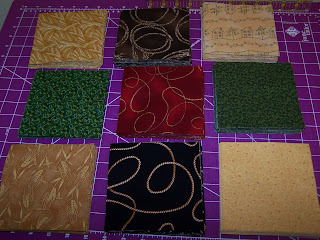 As of today I only have one quilt listed, but I have many more planned to complete. The name of my shop is Daisy Patches which is simply a combination of a few of my favorite things. 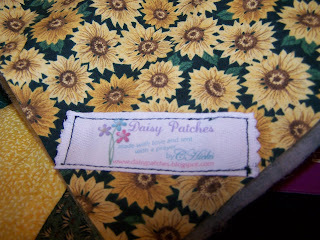 My favorite flowers are Daisies and my favorite quilts are patchwork, put the two together and Daisy Patches was born!! Click here to visit my Etsy shop, and please leave comments - I would love to know what you think! Still setting things up, more to come soon!